Robin Lopez is a selfless supporter of his team. 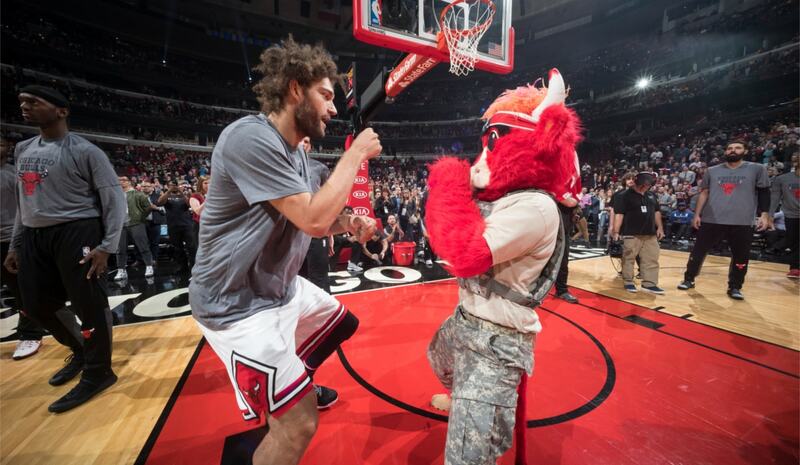 Robin Lopez is a guy who really has fun. Not just hitting golf balls or saying he wants to have fun, but having fun. Of course, Lopez is the alltime NBA mascot knockout champion, the Joe Louis of fighting mascots. There’s not that much competition. Though not so great with his right, which flew wide of Serge Ibaka last season in one of the NBA’s worst—and only—fights in the last decade. And then there was the time Lopez accommodatingly tied the sneakers for Jae Crowder when both lost their foot wear. Crowder got mad and he got the T. Robin’s really a teddy bear. Puppy lover, too, as he brought his giant dog, Muppet, who looked like the prize you never get at the top row at the carnival, to his Bulls exit interview last season. The guy who you’d see rolling over on his seven foot back on the sideline on those Dwyane Wade and Jimmy Butler dunks and who after being taken down by JaVale McGee in one game shot stretched out on his back on the floor, shot the ball in and signaled for a three-point play. Like when he called for an assist when that pass went off his face right to Taj Gibson for a dunk. And he and his twin brother, Brook, did perform that great service for the Force when at Disneyworld they pinned a medal on Chewbacca, who was grievously overlooked in the original Star Wars when Princess Leia gave medals to Luke and Han Solo. The Bulls say they want this season, no matter the wins and losses—and, yes, there are going to be losses—to be fun. Well, they’ve got the leader for that, also. "You mention veteran leadership; that's something that was actually passed down to me in Phoenix. Steve Nash, Grant Hill, they were always preaching whether you win or lose. You have to keep an even keel, keep a level head," Lopez told reporters after Advocate Center practice earlier this week. "Traditionally I've always led by example. But I've tried to be a little more vocal this year. Certainly, certainly (want to be the leader)." Really, it’s a good choice even with the insouciance and wild haired free spirit. Lopez is a serious basketball player, a nine-year NBA veteran playing for his fifth team and coming off an excellent season when he averaged 10.4 points and 6.4 rebounds in fewer than 20 minutes for the Bulls. He also was ninth in the NBA in offensive rebounds and 11th in the league in blocks. But it’s less the production, which is good with one of the best big man mid range shots in the game, than the attitude. The 29-year-old Lopez is one of those best teammates guys, relentlessly upbeat and supportive. And not just on the floor, where his screens are hard and competitiveness is red hot. "I've always had a bit of a temper," Lopez acknowledged. "So that's something I've tried to get back to and center myself in the league." We saw that when Lopez had enough of Ibaka and his elbows and hauled off with the right that fortunately hooked left. 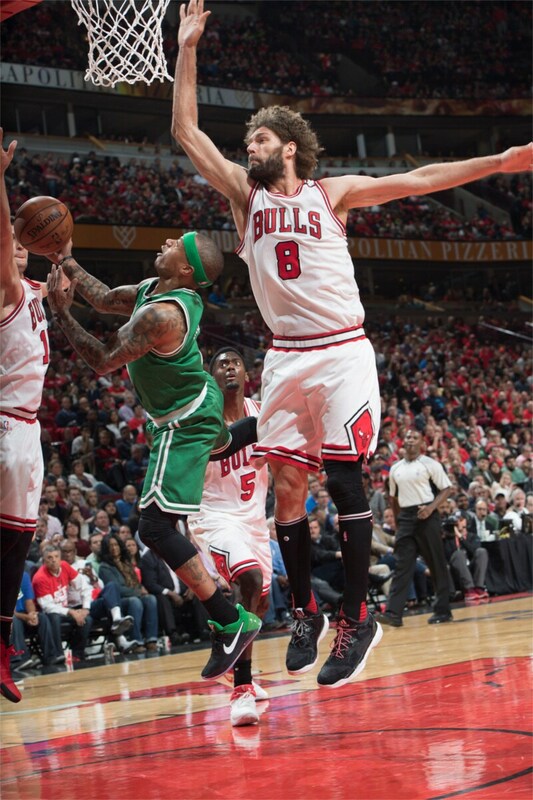 It resulted in the lone game of the season Lopez would miss, the only Bull to play in every game the NBA would allow. Lopez had played in all 82 games in three of the previous four seasons, the one game suspension keeping him from a league elite four 82 games in the last five. But Lopez is also the teammate who truly believes in what’s best. He accepts any role. Bulls coach Fred Hoiberg identified Lopez as the only sure starter with the new, developing group, especially with Zach LaVine still out. But Lopez would willingly come off the bench. He’s a popular and supportive teammate, mixing iconoclasm with selflessness and sincerity. He’s already given up his number 8 to Zach LaVine. Pay him? You’ve got to be kidding. That sort of attitude will be much in demand for this Bulls team on the turbulent NBA seas with such a maiden voyage. The Bulls intend to play faster with more perimeter shooting in the current NBA model. Lopez has always been more the defender with the mid range pop shot, but he’s adaptable and understanding. Leadership traits. "I don't want to talk about Phoenix too much, but I played in that style previously, an uptempo system," Lopez pointed out. "So I'm excited. I'm not as athletic as other players, but I like to think I'm versatile. I've become kind of a smart big man. I think I can adapt out there. Right now we're getting to know each other. As we get to know where everyone likes to be on the floor we're going to get better. I certainly want to form a kind of backbone on both sides of the floor. I like to think of myself as a consistent player, (knowing) what you're going to get out of me. I want to be consistent; I want to be reliable so everyone else can try to fill their roles." Which is also why there’s a bit of a conundrum surrounding Lopez. A veteran center like Lopez has trade value, and the Bulls are in the mode of collecting resources. Could a trade be on the horizon for Lopez? We’ve seen it often with teams rebooting. "You never know what's going to happen during the season," Lopez offered with an unconcerned shrug. "You never know what's going to happen during the offseason. The league's a business. Right now, I'm excited to be here. I'm having a good time playing with these guys. We're all growing together. So I'm having a good time right now." Times generally are good around Robin Lopez. Quincy Pondexter, whom the Bulls acquired from New Orleans this summer, was a high school teammate of the Lopez twins. So Robin is savoring their reunion. "Awesome," he said. "It's so cool to see that. I know he's been putting in a lot of work back home, Memphis, New Orleans, wherever he's been. It's a little bit surreal to be back on the court with him. I'm really relishing that opportunity and enjoying it." So just what does such an understated seven footer who is a visual cross between the Geico caveman and Sideshow Bob do in the offseason? "Traveled a little bit," Lopez said casually. "You know, Okinawa, Macau, Buenos Aires, Thailand." Sure, been there, done that. It may be a long, strange trip this season for these Bulls. It’s going to help with Robin Lopez aboard.